This Thanksgiving meatloaf is comfort food at its finest. It tastes like a combination of the two best things served during Thanksgiving dinner: turkey and stuffing. 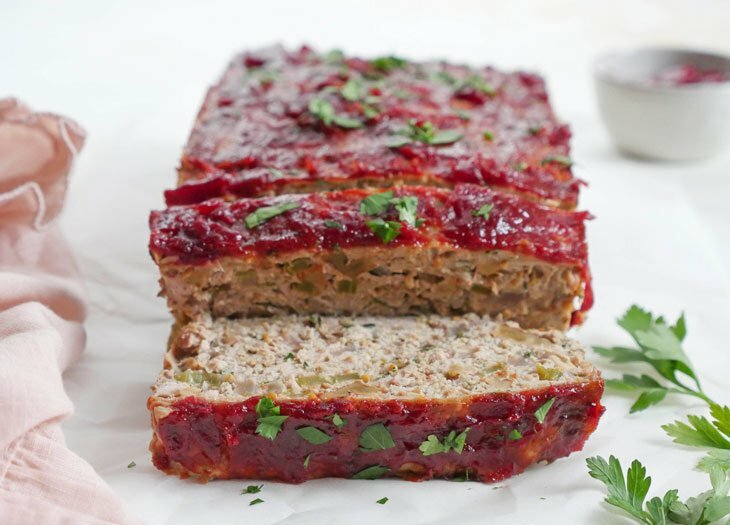 This main dish meatloaf is a great way to use up leftovers or make this instead of a big turkey on Thanksgiving day. 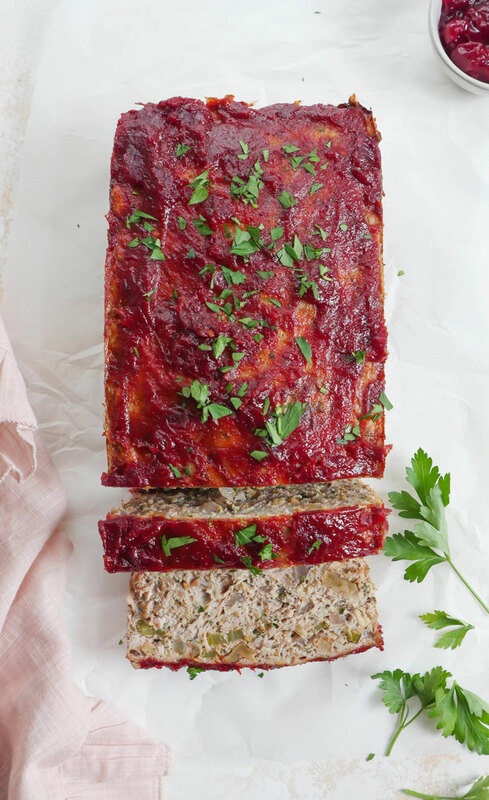 If you want to do a little something different for Thanksgiving this year, then give this turkey meatloaf a try. Or if you’re wondering what to do with all those leftovers, this is the recipe to make! Really you can make this whenever you want and enjoy delicious and comforting Thanksgiving flavors any time of the year. It would be kind of weird to make this in the summer though… I mean, I would do anything for meatloaf, but I won’t do that. (someone out there, please tell me you got that lol). My recipe for Thanksgiving meatballs is a favorite during the holiday season – they are super cute and make for an awesome appetizer. Well this meatloaf has all the same flavor but is much easier to make (no rolling meat into little balls) and can serve as a main course. 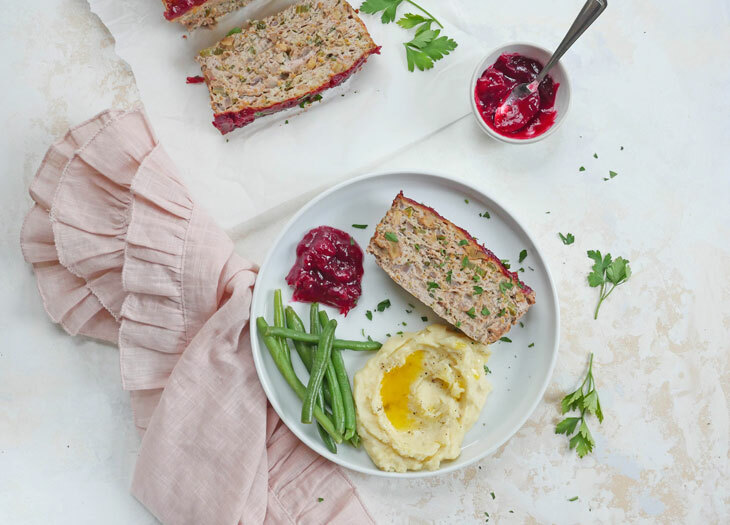 Like the meatballs, this meatloaf is also made up of fresh herbs, crunchy celery, toasty walnuts and topped with either cranberry sauce or a mixture or ketchup and cranberry sauce – your choice. Melt ghee/butter in a pan over medium heat, then add celery and onions and stir-fry for 5 minutes or until softened. Add walnuts and sauté for another 2 minutes. While the onion mixture cools, add the ground turkey, eggs, flaxseed meal/almond flour, herbs and spices to a bowl and mix well. Then add the cooked onion mixture and mix well. Transfer the mixture to a 9×5 loaf pan and bake at 375F for 45 minutes. While the meatloaf is baking, combine ketchup and cranberry sauce together in a bowl and mix well. Remove the meatloaf, spread the ketchup on top, then bake for another 5 minutes or until cooked through (should reach an internal temp of 165F). Allow the loaf to rest for 10 minutes, then slice and serve.